Commercial Media organizations are reporting that Felipe Calderòn won Sunday’s presidential election by 0.58 percent of the vote and will govern Mexico for the next six years, beginning on December 1. It would not be the first time that the Commercial Media has been wrong. It would not be the first time that lazy “pack journalism” got a major international story wrong. The truth: No recount occurred on Wednesday, or before, or since. What occurred – we repeat – was only the first official count of precinct tallies. 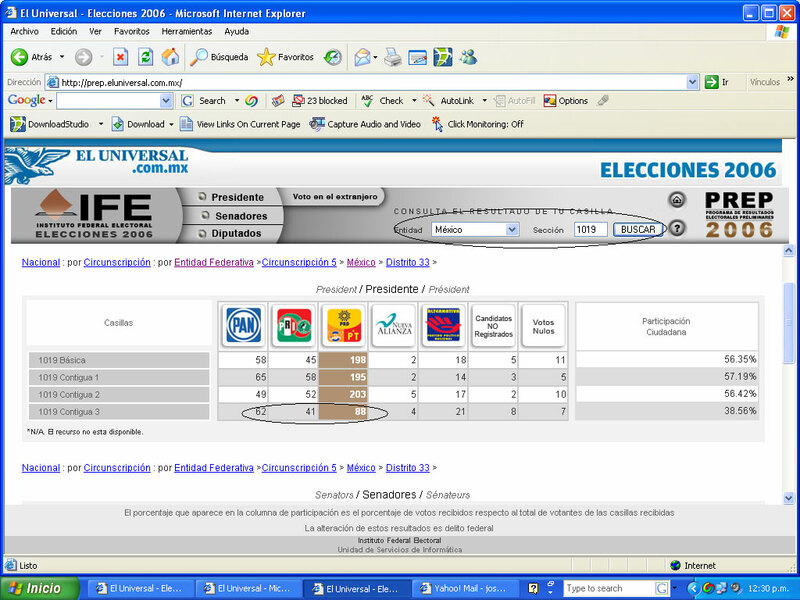 Part I of this series documented the election night dishonesty by Mexico’s Federal Electoral Institute (IFE, in its Spanish initials) when it withheld 3.3 million votes (about eight percent of the total) from public view while claiming that its Preliminary Elections Results Program (PREP) had tabulated 98.5 percent of the vote. Our report then showed that the inclusion of 2.5 million of those votes – when, under significant public pressure, IFE finally disclosed them – significantly reduced the agency’s original claim that Calderón had won by 377,000 votes: that total fell to a 257,000 vote margin in one swoop. Wednesday’s first official count reduced that margin by another 13,000 votes, even as the IFE refused to conduct hand-counts of more than 99 percent of the ballots. An electoral arbiter acting in bad faith, with an interest in preventing an accurate tally, would, in response to such hemorrhaging (the daily freefall, since Monday, of Calderón’s alleged margin of victory), act hastily in a manner that would prevent transparent completion of a careful count. On Thursday, in such haste, IFE chairman Luis Carlos Ugalde inexplicably usurped the legal role reserved for the judicial electoral tribunal (known as the Trife), by rushing to declare Calderón the official victor. For authentic journalists, Mexico’s post-electoral conflict is one of those gigantic news stories that happens few times in the course of a lifetime: Not merely a story about how a state-of-the-art electoral fraud was perpetrated in a major country of 100 million people, but, more historically, the story of how that fraud will be laid to waste. This news story will unfold for weeks, probably for months, before it is resolved. The first battle is already underway: the struggle to count the votes. It is objectively false to report, as major news organizations have done, that there was a “recount” of votes on Wednesday. There was no such thing. What occurred was the first actual counting of reported precinct results, something that occurs days after every election, and the results demonstrate the overwhelming evidence that a full recount is necessary in order to achieve an accurate result. On Wednesday, there was partial recount of less than one percent of the ballots: a partial recount that lowered Calderón’s supposed margin of victory by more than six percentage points, or more than 13,000 votes. In the context of the fraudulent results discovered in this sample of recounted ballots, it can therefore be projected that a recount of just 18.7 percent of the ballots would tie the race. A full recount – if the votes in the ballot boxes have not been tampered with or disappeared (as has already occurred in various parts of the Republic when marked ballots have been discovered in municipal dumps and garbage cans on the streets) – will show a victory by candidate Andrés Manuel López Obrador by more than one million votes: 1,056, 900, more closely estimated. López Obrador’s campaign is, in fact, seeking a recount of only those precincts where it found indications of fraud: a lot of them: 43,000, more or less. This extrapolation – if those precincts are counted vote-by-vote – would give his candidacy a victory of 243,000 votes. Despite the newsworthiness of the moment, even its value as a “ratings booster,” this opening statement by the prosecution will not likely be televised. Still, the facts will travel to every corner of the country and world by word-of-mouth, organization, and, significantly, via the Internet, which has an important role to play in this chapter of history. The north-central Mexican state of Guanajuato – home turf of President Vicente Fox and an importantísimo electoral base for his and Calderón’s PAN party – is where official results from the state’s 6,122 precincts (less than five percent of the national vote) gave Calderón a margin of more than 700,000 votes. That is to say, even according the highly suspicious official results, López Obrador won the rest of the country by almost half a million votes. This was a state where electoral fraud was carried out – and continues to be covered up – on a systematic basis. There, in Guanajuato, the official results from 640 of those 6,122 precincts show discrepancies and irregularities which include more votes cast than are voters in the precinct, more votes cast for Calderón than votes cast in the precinct, electoral officials that refused to count the votes in public, discrepancies between the actual result and the reported result, missing or suspect vote tally reports, each of them sufficient to trigger, under law, a vote-by-vote recount in the first instance; on Wednesday, despite motions to count the votes in each of those 640 precincts, Guanajuato election officials allowed only eight to be recounted. Those eight precincts – representing 0.13 percent of the state’s vote – reduced Calderón’s margin by 253 votes, or an average of 31 votes per precinct. If the remaining 632 precincts with irregularities were to show a similar shift, López Obrador’s count would increase by 19,592 votes. If all 6,122 precincts, counted by hand, were to show a similar shift, Guanajuato alone would change the national tally by 189,782 votes. From five percent of the Republic, Calderón’s official margin of victory would, according to our math, be reduced nationwide by 77 percent, from 244,000 to just 55,000 votes. That is just one state with just five percent of the nation’s population. Claims by IFE and others that the selection of civilian precinct authorities (something akin to jury duty) makes bias and fraud impossible are absurd. Corruption, in Mexican elections, is a two-way street with a long history. For every bribe or “dispensa” (food, construction materials, etcetera) handed out by a corrupt official to rent a vote or a voter ID card, there is a voter willing to do his part trade his vote (or his credential) for money or material things. The same goes for overzealous citizen poll staffers: A culture of corruption is not cured in a single election or in a six-year presidential term. It can only be countered by legal recourses such as the one that exists, or should: a vote-by-vote recount. The perpetrators of this fraud, the PAN party, complained for decades about the very heavy-handed tactics used by the ruling Institutional Revolutionary Party (PRI) to rob elections from the PAN. But once in power, the PAN adopted those same anti-democratic tactics for its own use. In a place like Guanajuato, where the culture itself is heavily PANista, more than ten percent of the precincts fell victim to such obvious fraudulent activity that poll-watchers from other parties challenged the irregularities on election night and again on Wednesday during the official count. In others, in this heavily PAN-dominated state, there simply were no opposition observers in the room on Sunday to make the challenge (the same occurred in other highly populated PAN-governed states like Jalisco and Nuevo Leon). The bias of the jurors (and, during Wednesday’s official count, by IFE employees) was made evident by the refusal to open the ballot boxes and count, vote-by-vote, even in 632 precincts where clear and challenged irregularities had occurred with sufficient evidence to force a hand count. 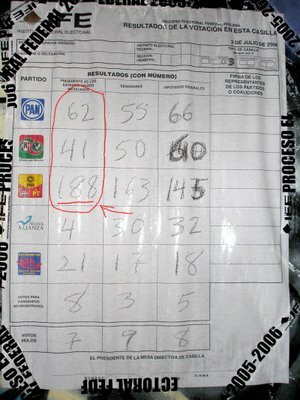 This kind of stonewalling by the PAN, in its electoral strongholds (not just in Guanajuato but also in Jalisco (and its capital of Guadalajara), Querétaro and throughout Northern Mexico, (including Nuevo Leon and its capital Monterrey), and the IFE all over the country indicates that the participants in this fraud are well aware that their victory is one of theft and criminality. Every step since Sunday they have sought to prevent a full recount under the eyes of the press and public. Human nature is human nature: people’s bias and partiality plays a role in the vote counting, too, wherever it can. None of this analysis requires a conspiracy theory (not to say there hasn’t been a conspiracy, either; in Mexican politics, it would be strange if there was not): It is sufficient to trust in human nature and its untrustworthy elements, not to mention human error. And this is precisely why a full recount is necessary. Those who oppose it or prevent it from happening reveal exactly why it must happen to clear up the significant public distrust of these results. If the pro-Calderón forces (including IFE) oppose that sunlight, that opposition strongly suggests that that they have reasons to prefer the darkness. Their refusal to permit it, if their opposition to a vote-by-vote recount prevails in these opening stages of the post-electoral conflict, assures that Calderón, if he makes it to inauguration on December 1, will face an impossible task of trying to govern an angry and organized population that does not consider him to have won legitimately. That the PAN is willing to risk even that is the best indication that it knows it “won” illegitimately, only through fraud. As for Guanajuato – Mexico’s “Florida” in this year’s electoral fraud – Fox and the PAN party did not invent the anti-democratic tactics that they have embraced there and elsewhere in 2006. They learned how to cheat from the PRI, when it governed that state, and where the PRI used the same techniques against Vicente Fox when he ran for governor in 1991. Revealingly, at the same present moment in 2006 when the PAN is attacking López Obrador’s announcement that he will file a legal complaint with the Trife electoral tribunal, the PAN itself is doing the same to challenge the local results for three seats on the Mexico City Council. What they say is that López Obrador should not appeal the results or spark civil resistance. But what they – the PAN - themselves have done is exactly what he – Obrador and the PRD - and his supporters are likely to do this summer and fall. With a 244,000 “official” margin in the nation’s 130,000 precincts, the IFE-claimed margin comes down to less than two votes per precinct: less than two per ballot box, as many precincts contain more than one. 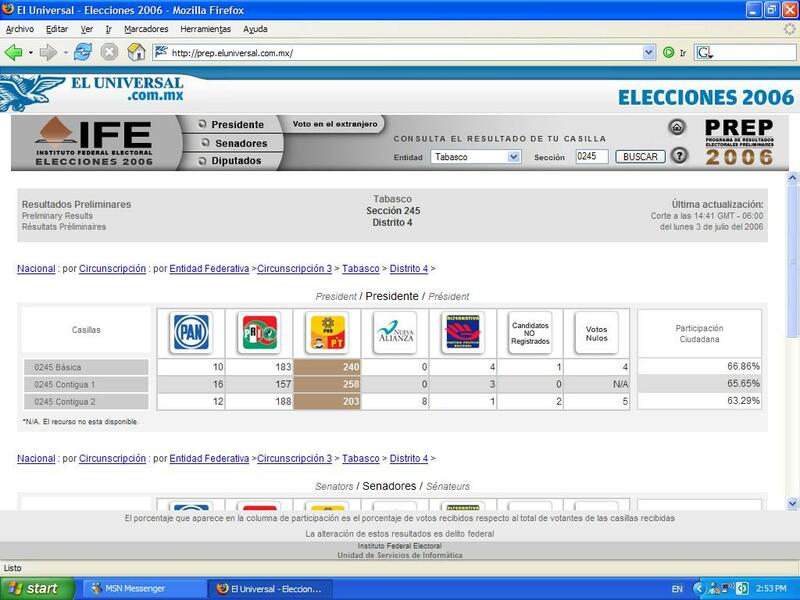 An electoral fraud can be carried out simply by “shaving” or adding a few votes here and there: this pattern is already documented to have helped Calderón on the IFE PREP totals, and that IFE’s own website furnished the visible proof may explain why IFE – for all its claims of transparency – has not put the Wednesday “official count” results up by precinct online. Even as IFE has declared Calderón the winner, it has refused to account, precinct by precinct, where it got its current set of numbers. 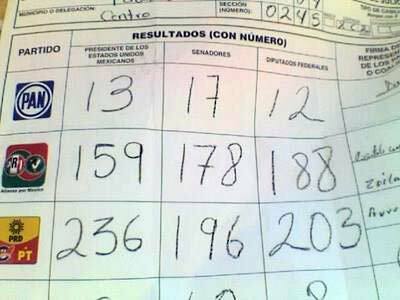 Take a look at this photo of the “acta” (the signed precinct result) in Tabasco precinct number 0245, ballot box #2, and compare it with the result that IFE reported on its PREP system: The acta says that López Obrador received 236 votes: IFE’s PREP results, though, showed him with 203; a reduction of 33 votes from a single ballot box. In other districts, there was a pattern of one vote shaved from López Obrador between the acta and the PREP results, or one vote added to Calderón. Narco News has reviewed similar photos of that phenomenon from Baja California precinct 0105 (62 votes for Obrador, 61 reported), and from Baja California precinct 0548 (190 votes for Calderon, 191 reported). Here are some others; this report only cites those that we have been able to review via photographs of the original actas: Veracruz precinct 2073: 188 votes for Obrador, 186 reported, two votes disappeared. Morelos precinct 0061: 194 votes for Obrador, 190 reported, four votes disappeared. Mexico City precinct 2411: 139 votes for Obrador, 134 reported, five votes disappeared. Querétaro precinct 0375, ballot box #1: 103 votes for Obrador, 102 reported, one vote disappeared. 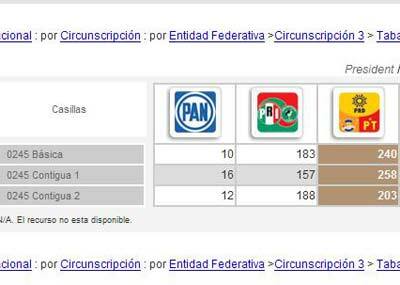 State of Mexico precinct 0855: 208 votes for Obrador, 197 reported, 11 votes disappeared. 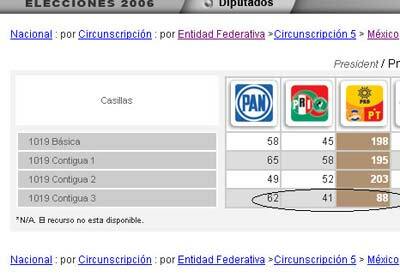 State of Mexico precinct 0297: 167 votes for Obrador, 159 reported, eight votes disappeared. Mexico City precinct 0444, ballot box #2: 322 votes for Obrador, 318 reported, four votes disappeared..
We have not seen a single photograph of the opposite occurring: of votes taken from Calderón or added to Obrador. This election fraud tactic is known in Mexico as “estilo hormiga,” or “ant style.” In an election this officially close, there is no question that, if undetected, small shovelfuls of votes diverted or hidden can make the difference in the national result. That IFE chairman Ugalde rushed to pronounce a winner on Thursday before his agency publicly disclosed the precinct-by-precinct tally counts is cause for concern: No citizen, candidate or party is able to confirm that the actual results from the hard count match the IFE final tally. In the context of this pattern of “ant style” differences with the PREP results on Sunday, and IFE’s dishonesty (see Part I of this series) in hiding 3.3 million votes from the PREP results while claiming 98.5 percent had been counted in them, Ugalde’s panicked rush to declare a winner without providing transparency in the result seems all too much like a repeat of his suspicious Sunday performance. Do the Ballots Still Exist? Earlier this week, Narco News shared reports and a photo of ballot boxes and ballots from the Obrador stronghold of Nezahuacoyotl, discovered in a municipal garbage dump. Similar sightings (photographed and notarized) have been unearthed in Veracruz and Mexico City (also bases of Obrador’s support). Here is a photograph from today’s La Jornada of three completed ballots found adrift all alone in a Mexico City garbage can: two of those votes are for Obrador, the third is for PRI candidate Roberto Madrazo. Lost ballots found in the garbage. What might explain IFE chairman Ugalde’s rush to pronounce judgment and opposition to a vote-by-vote recount is the possibility that these are not isolated cases; that if a full recount is ordered, but the ballots no longer exist in safe keeping, all the IFE and mass media claims of a “clean” electoral process will find themselves in the garbage dump of history. More personally, IFE officials could go to jail. Again, the only way to find out would be to conduct a full vote-by-vote recount of the kind that IFE and the PAN so vehemently oppose. Wednesday’s hard count of precinct results was bizarre to behold. Your correspondent published, via the Narcosphere, the hour-by-hour results reported by IFE. Interestingly, from the noon hour Wednesday when we first began tracking and logging the results, when 25 percent of the precinct counts had been reported, and hours later, when 65 percent had been tabulated, López Obrador consistently polled ahead of Calderón by 2.42 to 2.76 percent of the vote (a percentage consistent with our projection that López Obrador won by about one million votes); both candidates had almost no fluctuation to their totals. The manner in which that tally suddenly changed course is bizarre from a mathematical or statistical perspective. As the latter third of the results came in beginning at 4:44 p.m. on Wednesday, Calderón’s vote percentage began to creep upward as López Obrador’s creeped downward by equal and opposite amounts. During this count of the final 35 percent of the tallies, interestingly, PRI candidate Roberto Madrazo’s percentage remained steadily the same as it had all day (within half-a-percentage point, landing at 22.26 percent) as did that of the also-rans Patricia Mercado and Roberto Campa. All day and night – see the accompanying graph – three candidates remained with their totals in a straight line, but in the final stretch only Obrador and Calderón percentages diverged from the consistency of the first two-thirds of the tallies. Calderón partisans (including IFE and the mass media) explain the final shift as one of northern Mexican regions coming in last. But Madrazo’s vote, in particular, was uneven nationwide. This was shown by IFE’s PREP results in the breakdown among the five regions by which the vote count was organized. Madrazo’s regional totals were 24.09 percent in Region 1 (Northern Mexico) and 23.12 percent in region 2 (North-Central Mexico), the regions from where Calderón supposedly got his late surge in Wednesday’s precinct count: nearly one and two points above his national average of 22.26. Had the final tallies in Wednesday’s precinct count really come in from the North and North-Central regions, a statistically significant upward shift would have been registered from Madrazo as well. That it did not casts important doubt upon the claims by IFE and television media that a regional vote saved the day for Calderón at the eleventh hour. Again, these are from the already discredited PREP results, but it is significant how divergent Madrazo’s tally is region by region, and particularly how he finished higher in the two northern regions than in the combined three central-southern regions. And yet the sudden divergence early Thursday morning between Calderón and Obrador – according to IFE’s still undocumented conclusions – did not statistically change Madrazo’s total as it would have had it mainly come from Calderón’s northern base regions. Suspicions about computer-generated fraud – rooted, in part, in the fact that IFE’s computer systems were partly designed by companies and partners of Calderón’s brother-in-law Diego Hildebrando Zavala – have been raised anew by the statistical anomalies and inconsistencies both in the PREP counts and hard counts claimed by the IFE, particularly the lack of fluctuation in Madrazo’s hard count tally at the very moments when a radical shift occurred from Obrador to Calderón. And the fact that IFE chairman Ugalde rushed, at 4 p.m. Thursday, to declare a winner without having transparently reported the region-by-region and state-by-state results (at press time, IFE still has not published them) smells as rotten as the legal fact that Ugalde is not empowered by any law to declare a winner but that he inexplicably did so anyway: that task belongs, legally, to the judicial branch of government, the Trife tribunal. Ugalde’s illegal hurry suggests motive to literally play fast and loose with the facts, as he has done. So why did Ugalde, arrogantly and illegally, steal that role for himself? What was his hurry? What was his fear of waiting, as the law provides, for the Trife to declare the winner? This article requires, among other things, that the government provide “certainty” as to election results (as well as “legality” and “impartiality”). The mere existence of widespread public uncertainty (as well as illegal and biased activity by the IFE) provides the supreme electoral Tribunal with absolute legal grounds to reassert conditions that would restore public certainty. The Trife therefore has the power, and responsibility, to require a recount as the obvious and only means to restore that certainty. This article clearly states that, in case of conflict between IFE’s interpretation and that of the Electoral Tribunal, the Tribunal has final power and say. Thus, the Constitution – see Article 41, especially the part about the requirement for “certainty” – must be interpreted as determinative over any IFE regulation. That’s the law. It allows for, and requires, public “certainty” in presidential election results: something that does not exist today regarding Sunday’s vote. A recount is the only path available with which to establish that certainty in the 2006 election results. But that presumes that the hype is true: that Mexico counts with honest institutions transparently upholding the rule of law. Your reporter witnessed, in 1999, that same Supreme Electoral Tribunal – the Trife – fail to comply with its mandate at an hour when the voters of Guerrero were denied certainty of a gubernatorial election plagued with evidence of fraud. At that moment, the Trife ignored the public uncertainty, and allowed the PRI candidate to triumph in a situation very similar to today’s, in which the Guerrero state IFE granted, by a dubious one percent of the vote plagued with similar irregularities, against a candidate of the PRD for governor. That was then. This is now. If the Trife decides to repeat its dark history, this year on the national level, what argument shall be left that the Mexican people can or should have faith in their institutions? The Trife will decide one matter – whether there shall be an authentic recount of the votes – but, in doing so, it will also determine the legitimacy of the Mexican Federal State. If it opts again to ratify illegitimacy, by denying a recount, nobody should claim surprise if the people respond accordingly, and take that power away from the corrupted institutions of the Mexican State.